This week we look at attribute inversions in intelligent lighting control, the use of Pan or Tilt Invert in particular. So what is attribute inversion, why would a console programmer use it and when is an invert most useful? On Stage Lighting turns your world upside down. If you have some understanding of intelligent lighting, you might know that the word “attributes” refers to distinct fixture parameters such as Intensity, Pan, Tilt, Gobo Wheel 1 etc. Each attribute channel is controlled by a value between 0 and 255, in the case of Intensity 0 being 0% dimmer output, 255 being FULL. Pan, Tilt and other gradually controlled attributes such Cyan change on a similar sliding scale. Attribute inversion is the practice of reversing the behaviour of the parameter relative to it’s control channel value – in the case of Intensity, a zero value would result in the dimmer output of FULL. An inversion of the Intensity attribute. While it maybe possible to invert the behaviour of any fixture attribute, in practice the most common inversion is that of the Pan or Tilt parameter of a moving head or mirror. The end result of an invert of either a Pan or Tilt attribute is that it makes the control channel behave “back to front”. Instead of panning left, the fixture moves right. Instead of tilting up, it goes down. Reasons for inverting a Position channel could be to either fix a rigging error or create any easier environment for programming moving lights. Fixing an error – If the crew happen to have rigged a moving spot the “wrong” way round (180 degrees to the rest of the fixtures) then selecting a whole bunch of fixtures and moving them all together doesn’t work. The misplaced fixture moves in the opposite direction and pre programmed effects also run backwards during playback. Rather than bring the rig in and rehang the spot, the programmer can simply invert the Pan/Tilt channels at the console and order is restored. Another common error is that many moving lights allow the user to invert channels at the fixture itself, using the on board menu or switch settings. This might be left over from a previous show, the heads not having been reset to factory settings during a hire prep. Making programming easier – This is a positive move to speeding up position programming and fixture behaviour in some circumstances. Inverting the Tilt attribute of fixtures on the deck (sat on their bases) means that they move in the same direction as those hung in the air from clamps. Selecting all the heads and tilting them, all move upstage and downstage together. Inverting the Pan attribute fixtures on one side of the centre line creates mirrored movement, where opposite pairs move toward centre together. This can speed up programming certain rig layouts and can even be used to rough-in a full rig of positions with only half the fixtures working. If you think this sounds pretty far fetched, it isn’t – I’ve done it. This workaround requires that at least one of every fixture “buddy” is running. More about these buddies later. Another product of Pan inversion is that movement effects generated within the console, and moves from one position to another, happen symmetrically across stage. There are two choices to setting a parameter inversion – at the fixture or within the lighting console. The worst situation is some inversions at the fixture, some set within the desk and know one knows what’s going on. The preferred choice, given professional level equipment, is at the lighting desk. Knowing that all your heads are physically set up the same and leaving patch editing functions in the programmers hands is reassuringly structured. Inverting a channel at the console is usually part of advanced patching, setup or fixture editing control functions. Setting an invert within the function menu of the fixture itself is usually reserved for situations where you are using control equipment that doesn’t provide the facility to perform inverts. Controllers with less than full functionality can often be quicker and easier to use if these local inverts are set. Something to think about when you are next running 4 scanners with a 12 channel, 2 preset desk. Which ever way you decide to set an attribute invert, the most important thing to remember is that it must be done BEFORE any position programming takes place. Setting inverts will ruin any position work you have already committed to the desk. The negative side to setting Pan inverts is that they make some fixtures move in the opposite direction. OK, you say, that’s what we wanted right? Having some fixtures pulling when others are pushing can be good or bad depending on rig layout and your aims as an LD/programmer. You might have a rear truss loaded with 16 moving spots and planning to use Fan effects on the desk to create some awesome looks. You may want to create some offset Pan sweeps, creating a horizontal wave effect from one end to the other. Modern lighting consoles have tools to speed up the programming of this kind of sequence but the effects are harder to achieve without all the heads moving the same way by default. So you choose your poison. The type of rig that can benefit from a few Pan inversions could be a concert or dance rig that requires quick position programming and symmetrical effects. Fixtures that have an “other side of stage buddy” are ideal candidates for pairing with one of the heads having an inverted Pan channel. Far Stage Left and Far Stage Right, Drum Riser Left and Drum Riser Right etc. Having these buddies working symmetrically means fine tuning your positions is often a matter of selecting a pair and moving them in one hit. Top OSL Tip – You might find that you need to move both buddies in one direction, maybe to centre them up on stage. The quick method for moving both these guys, toward stage right for example, is to use the Fan tool. As one fixture has a Pan invert set, they actually move in the same direction. Obviously, you might have some fixture positions that would be prime candidates for some inversions plus others that aren’t, like our rear truss spots. Part of the rig could have inverted buddies, other banks of fixtures might work together. Some say that you should use fixture orientation and Pan/Tilt inverts to make sure that every fixture moves in the direction that you would expect uniformly across the whole rig eg. Wheeling the Pan encoder clockwise results in every fixture moving to Stage Left. This is dogmatic simplification that misses a host of programming and playback possibilities and can make certain looks a whole lot harder to create. If you are working in a 360 degree environment like a large night club, the idea of a “correct” way for a fixture to pan is plain silly anyway. Perhaps this is why such invert techniques are more likely to be found in the work of club or concert programmers, rather than theatre ops. As we are talking about the nature of the rig helping to choose invert tactics, we come back to tilt inversion. Although Tilt invert is commonly used to align fixtures sitting on their bases with those hanging down from a structure, it can be used for other purposes. Perhaps the fixtures are laid out in both forward and rear positions and you wish to be able to wheel the entire rig either toward the stage area or away in one motion. Once again, the choice depends on not only your preferences for programming but also the resulting playback of pre-designated effects. A setting that does what it says on the tin: Swaps the Pan control with the Tilt control channel. This used for fixtures that are rigged on their sides, such as the side of an upright truss, that makes their pan/tilt movement apparently “wrong” in relation to the stage. Swapping the Pan and Tilt doesn’t allow us to reap any other programming benefits unless you’d just like to confuse the next person to use your console. There are occasions where it might be necessary to invert other attributes apart from Pan and Tilt. This sometimes applies to other linear parameters like Intensity and CMY or RGB colour mixing and can be done at the console or within a personality file. This kind of invert is a more unusual kind of housekeeping required when the fixture personality file is incorrect and the fixtures do not behave as expected. The inverting of other attributes is not usually employed to create a useful programming or playback tool. 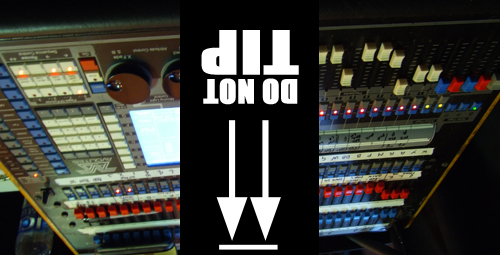 We’ve taken a quick look the practice of fixture position attribute inversion, the different methods of doing it and some advantages for the moving light programmer. As setting inverts is something that should be done before any programming begins, it’s important to think about the pros and cons early on. Trying out position invert tactics on a small set up of around four moving lights should give you an idea of what they can do. If your control won’t do it, even the most basic scanners have some on board setting. When you are comfortable, you can unleash the power of “back to front” on your next monster rig.